Athens is a great city to visit and travel around. Despite the debt crisis but stimulated earlier by the 2004 Olympics the city has an excellent transport system with innovation precipitated by the lack of finance. We can learn from this for the Rail Review. The Athens card is all mode and comes as a contactless ticket for single journeys and day tickets and longer periods. Note the pictogram of modes available and the Metro showing at a lower level. It includes bike parking. All Railfuture members are encouraged to keep an eye out for best practice on other systems so as to strengthen our arguments as we campaign for not only a bigger railway in Britain, but a better one in terms of the passenger environment, particularly passenger information, ticketing and ease of use. In this context, not being familiar with a particular system, nor the language can be an advantage as it provides a true test on whether a system is focussed on the passenger. Many of us are familiar with air travel and expect and usually find no problem with using airports, although often getting from the airport to the City can be the most taxing element of air travel. Greek Railways or Hellenic Railways (OSE) are operated in two distinct parts, like in Britain, the infrastructure (OSE SA) and the operations meeting EU requirements far more closely than organisations such as SNCF and DB. The debt is huge as is the case with the Greek economy, the national railway is run down with low ridership and most international long distance services withdrawn, including that to Belgrade (closed down in October 2018). This is changing as the only way of investing in improving the infrastructure is borrowing or growing the business, so that access charges can become a more significant proportion of the costs of infrastructure provision, currently about 20%. The passenger operations were sold to Italian Railways in 2017 and the main focus is on providing a competitive rail link between the two largest cities in Greece, Athens and Thessaloniki, with a target journey time of 3 hours. Before the project got underway the rail trip took between 7 and 9 hours, but the focus on Inter City now has it down to 4 hours. The journey of about 500km takes about 5 hours by road, so this would appear to be a viable project and from observation of airline check in procedures and queues at Athens airport, quicker than air (although the air distance is much shorter at about 300km). Graffiti on just about every carriage in the fleet is off putting, something that Italian Railways have been slow to tackle in Italy also, but the trains, where they run, are perfectly acceptable and an online reservation system is in its infancy. A strategy of a good Inter City route between the two key cities and a proper integrated transport system in each is probably a good one on which to rebuild a nationwide transport system. Neighbouring countries particularly FYROM (Skopje) and Bulgaria (Sofia) are doing likewise and gradually linking up with Greece. This project is still not complete so Thessaloniki still has no Metro. The city entered discussions with TfL some time ago regarding joint procurement of light rail vehicles with DLR. Fortunately this did not happen as it became evident that funding issues were a significant threat to the delivery of the project. An earlier visit to Thessaloniki, a really nice European city, revealed little metro construction activity although an announcement was made in June 2018 that the tunnel section was finally complete. Thessaloniki, as a coastal, linear city, is ideally suited to a single metro route and people there cannot wait to see it open. We will have to wait a little longer to try it. This is what started the rail transport revolution in 2004 - The Olympic Games. Athens is a large dense city with a metro population of about 3.75m people. Greece has 11m people so getting transport right in Athens is important. Athens had the second oldest urban railway in Europe after London, to Piraeus (the port of Athens) built in 1869 but nothing much happened since until 2004 when Athens was chosen for the 2004 Summer Olympic Games. This would have been unsustainable without a proper transport system. The result is a well cared for legacy transit system with many good attributes, including huge ridership, to commend it. They have spent the capital money wisely, using existing infrastructure where possible, as well as new alignments to provide a fully integrated metro, light rail, trolley bus and bus transit system that is easy to use and which has formed the base for further extensions and new lines. Athens Airport Railway or Rotherham Tram Train eat your heart out! The principal gateway to Athens is Athens International Airport used by 22m passengers per annum, spectacular growth from 2013 (12.5m) during the debt crisis. 7.5m passengers are domestic, unsurprising given the geography of Greece and the state of the rail network. The airport is 34 km from the city centre and good rail links to the airport were the number 1 priority. The airport line opened in 2004 for the Olympic Games, as a heavy rail main line route. The aspiration was also to connect the developing metro to the airport but the state could not afford new construction of a separate alignment so via a complex governance structure they went for a tram-train style solution, but in this case metro and main line rail on the same route using the same stations. The airport station has separate platforms for main line (low height) and Metro trains (full height – level boarding). The operation is main line 25kv ac overhead at surface, as Rotherham should be. Interestingly, at the intermediate surface stations on the joint running section a central island platform has been provided with access and facilities in the centre. One end is low height, a ramp in the middle the other end being full height. This arrangement was eventually adopted for Rotherham, but here access is at one end only – not so good. Why Network Rail adopted 750 v dc for the main line section is inexplicable given the purchase of dual voltage tram trains. The trains were built by Hanwha Rotem – Mitsubishi, modern wide gangway trains with electronic information. There are only 7 of these sets capable of dual supply operation, so the frequency is low at 2 trains per hour. Travel on this service is reminiscent of travelling on the Hong Kong Kowloon Railway. The Athens underground urban metro Line 3 terminated at Doukissis Platentias station where dense Athens urban population ends and the mountains start. A junction has been constructed here and suburban main line trains continue at surface and a ramp constructed from the airport joint line into the Metro station for airport metro trains. Airport trains change system there and proceed as a conventional metro with third rail pick up the length of Line 3, stopping at all stations sharing the tracks with a five minute frequency metro service. This arrangement was devised based on cost expediency but from a passenger perspective the result is dramatic. It provides a fast direct service from the airport with distribution within the city to all stations on Metro line 3. In fact with one change only you can reach every station on the Athens Metro and the tram system from the airport, a situation not repeated anywhere in Europe. Compare this with Heathrow Express whisking you, at a higher premium fare to Paddington then queuing for a taxi or an inconvenient exchange with the tube. Crossrail sorts this of course, but at the price of a completely new alignment across London. Level access has been constructed from the airport terminal via a set of travelators over the roads to a terminal station. The station is staffed and a premium single fare of 10 Euro is charged to service the cost of construction. This fare is to anywhere on the metro system. The billed taxi fare is 38 Euro to the centre. There are three metro lines denoted by number (1-3) and colour (Green, Red, Blue). The fare is a flat fare of 1.4 Euro per journey (other than on the Airport extension) or 4.5 Euro per 24 hours. With the latter you can certainly get your money’s worth. All the principal tourist hotspots are served. Ticket purchase is the Athens Card available from machines with about 8 languages on offer. It is a barriered system and the Athens cards are contactless. The system is well signed by colour and very easy to use even by people not familiar with it. The ancient Greeks clearly had a head start with good infrastructure design and the stations, particularly with wide concourses reflect that. Escalators run in either direction according to demand. A nice touch here is a moving escalator sign (pictured) indicating where these are and what direction they are running clearly visible as you alight from the train. Escalators are spread along Metro platforms but singly to reduce the width of the station box and hence minimise construction costs. These moving signs are clearly visible directing passengers where to go for the escalator, which varies. Information has been standardised and each station features a set of three maps of the surrounding area, varying in scale, in a standard frame, making it very easy to know what to look for. Full marks for thinking about the passenger here. A strange anomaly however is that station names are illuminated and easy to see but lower case letters have been used. They are therefore much harder to read from the viewpoint of a non Greek speaker whereas Greek capital letters tend to be less confusing. Standard displays at each metro station showing different scale maps of the surrounding area served. Other information is elsewhere. The original surface 1869 Piraeus line has been extended as Line 1 in tunnel as a modern metro across the city, and integrated into the system. This is quite a contrast from the original terminus station at Piraeus which has been nicely preserved inside, but a bit of a mess outside. Other than this the whole system is new provided for the Olympic Games in 2004. However it was not until 2011 that the government managed to pass an Act to put the whole system under unified management choosing the rather unfortunate acronym STASY. Restored 1869 Piraeus station at the end of the line. Bit of a contrast to the modern system. Looking at this system from the viewpoint of an unfamiliar customer, the Athens system must rank alongside Madrid, Milan*, Moscow* and Amsterdam in terms of ease of use and attractiveness, although this is of course subjective. Difficult to believe that this is near the centre of Athens where one lane of a dual carriageway has been replaced by the tram. The dual carriageways of Birmingham would lend themselves to this treatment. Network Rail clearly did not design the catenary! This is a thoroughly modern standard gauge light rail system using low floor light rail vehicles run by STASY with integrated ticketing with the rest of the system, as are the buses. The original narrow gauge Athens trams were closed down in 1960 but a nice touch, just near the Acropolis is a cobbled street lined with restaurants, beautifully restored with its original 3’ 6” gauge tram tracks. The new system was opened in 2004, again for the Olympic Games, but is still developing. It is Driver Only Operated as most systems are with ticket machines and low platform stations. These are nicely integrated into the urban realm. Single tickets which must be validated on the vehicle are valid for transfers within 90 minutes. There are three routes numbered T3 to T5 (the Metro is M1 to M3) but the same three colours are used which is an odd choice. (The tram and Metro system were separately managed until STASY took over in 2011). The principal route starts from the centre of Athens at Syntagma Square opposite the Greek Parliament building and runs through pleasant medium density suburbs to the Aegean coast at Mousson. It divides there and runs both ways along the Aegean Coast seafront on a reserved alignment with grass track. The coast appears to be mainly up market residential, not particularly high density providing high quality living on the coast away from the pollution of Athens. The well used light rail system has clearly made this coastline much more viable for commuting. The western leg stops at the SEP sports stadium 3 miles short of Piraeus, the busiest port on the Mediterranean. You can walk to the penultimate Piraeus Metro line station to get to the town. The modern all low floor Athens tram system runs from the city centre along the Aegean Coast. Well worth a ride to see best practice in terms of integration into the urban realm. The tram route extension into Piraeus is currently well under construction with street running and high quality urban realm designed to regenerate the original town centre away from the port area served by the Metro, and multiple kebab shops. Piraeus is a surprise. There is a huge inlet harbour containing the RoRo and cruise liner port, familiar to many people transferring to ferries, not particularly a destination in itself. But to the south of this there is a lovely coastline again with up-market flats and quality restaurants, yachting marinas etc. 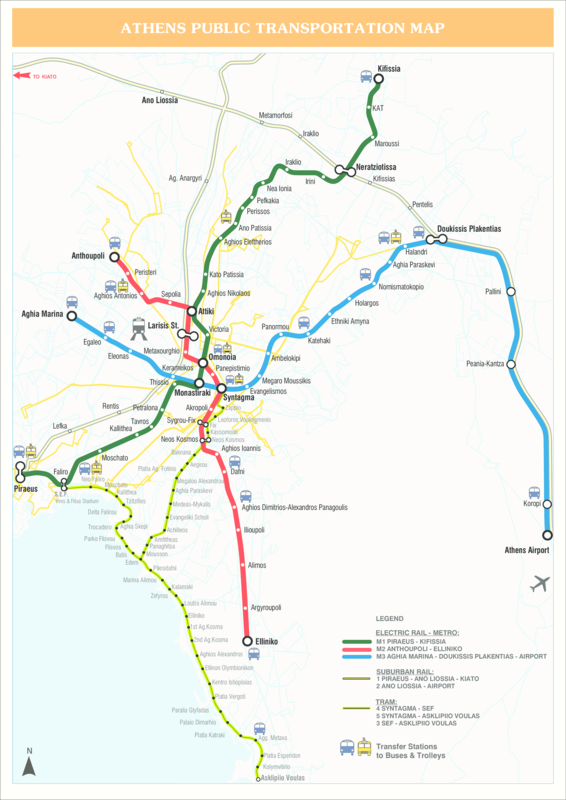 The light rail system, when completed should provide a new transport system for the town as well as linking it to the Aegean coastline. From seething road chaos to calm upgraded urban realm under construction to regenerate Piraeus centre. Overall Athens is a great city to visit and travel around. Despite the debt crisis but stimulated earlier by the 2004 Olympics the city has an excellent transport system with innovation precipitated by the lack of finance. We can learn from this for the Rail Review. Could it be that some of the cost problems with our infrastructure projects in the UK is too much availability of capital funds for those schemes that have gone ahead, preventing others? Or is it that Archimedes‡ started a trend for efficiently moving objects around with maximum efficiency, albeit waiting for the most recent Olympiad in Athens in 2004? Pollution in the form of poor air quality is reported as responsible for 6% of deaths in Greece attributed particularly to diesel engines in road vehicles. Diesel engines were banned in both Thessaloniki and Athens in 2001 with material benefits. However on account of the debt crisis, to help the economy the ban was lifted in 2011 and diesels came back. Given a return to high levels of pollution a resolve has recently been agreed to reinstate the diesel ban in 2025 – fourteen lost years. Good public transport in the city has clearly made a difference in terms of modal share transfer with huge numbers of people using the transport system, but the roads are still jammed with traffic. The transport system investment has clearly worked in terms of making the city’s economy work with enhanced mobility, also making tourism viable. It has not solved the pollution problem, where even after four days a trip to the pharmacy was required for medication to wash out the sinuses. It is clear that the solution must be a combination of further investment in the transit system, also using light rail and adapting the national rail infrastructure in innovative, cost effective ways - but this must be accompanied by traffic restraint in a country where driving badly at high speed is part of the national identity. It is easy to be critical of this decision but the recent hysterical reaction to the Clean Air consultation in Birmingham where people say they will have to leave the city rather suggests that the politics of motor car dependency is not confined to Athens. Perhaps if Birmingham had as good a metro system as Athens the outcry would be less strident. Athens is a great city to visit with friendly people who really know how to preserve and display its antiquities. They are clearly on the case but they really do need a bit more help from the EU. * Railfuture has also investigated Milan and Moscow for Go and Compare articles. Moscow is a particularly friendly system for visits, easy to use and hence listed here. Moscow is yet to implement a fully integrated ticketing system, but at least you get to talk to people. ‡ Archimedes lived in Syracuse, Sicily which was a Greek city state!